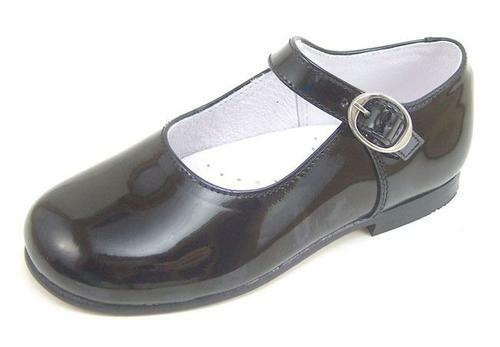 Classic "English" Mary Janes in premium black patent. Handcrafted in Spain using top quality components. 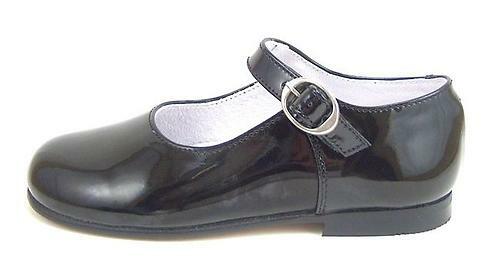 The patent is genuine leather (not vinyl). Full leather breathable lining and insole with cushioned arch support. Internal "counters" for support and good wear. 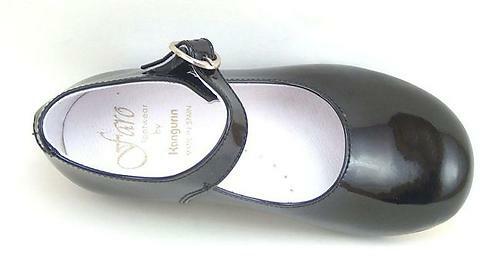 Leather-substitute sole with slip-resistant finish. FITTING: Shoes vary so please compare foot length with insole measurements, allowing 3/8"+ for legwear, wiggle room & growth - consultations always OK.
EU 20/US 4.5 = 5"
EU 21/US 5 = 5 1/4"
EU 22/US 6 = 5 1/2"
EU 23/US 6.5 = 5 3/4"
EU 24/US 7 = 6"
EU 25/US 8 = 6 1/4"
EU 26/US 9 = 6 1/2"
EU 27/US 10 = 6 3/4"
EU 28/US 10.5 = 7"
EU 29/US 11.5 = 7 1/4"
EU 30/US 12.5 = 7 1/2"
EU 31/US 13 = 7 3/4"
EU 32/US 1 = 8"
EU 33/US 2 = 8 1/4"
EU 34/US 3 = 8 1/2"
EU 35/US 4 = 8 3/4"
EU 36/US 5 = 9"